Not too terribly long ago, we wrote about the Canadian edition of Lay’s Do Us a Flavour promotion, in which the nice people at Lay’s asked for public suggestions for new chip flavours, selected four finalists from these suggestions, then turned those four ideas into chips that the public could taste. 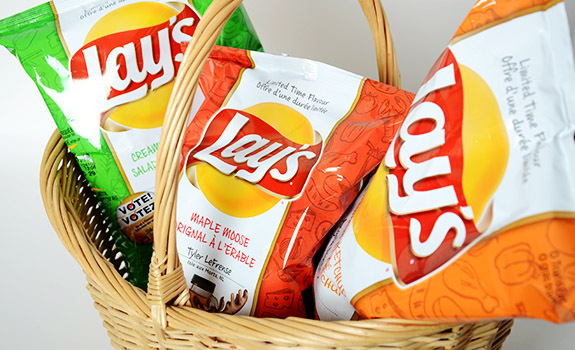 It was a contest, with the most voted-for flavour winning entry into the line of Lay’s chips, and a cash prize (and portion of future sales) going to the person who initially suggested the winning flavour. An interesting idea, certainly. We here at NEAROF! have noticed the recent demise of the winner of this competition, the terrible Maple Moose. We can count on one finger the number of times we’ve thrown out a bag of chips without finishing it, but Maple Moose’s near inedibility forced our hand. Why it won in the first place is simple enough: it got more votes than the other flavours. Be it through some misguided act of patriotism (moose! maple! ), the story behind the chip flavour’s creation or regional loyalties, it tugged just enough heartstrings to make people click on a button. Why it crashed and burned is equally simple: while people were easily prodded into voting for a chip flavour online (even though they may well never have tasted it), getting them to fork over the cash for a bag was apparently a much harder sell. I can’t imagine many of the people who bought it and tried it wanted to buy a second, third or fourth bag. Marketers know they can harness curiosity to get the initial sale, but that only works for the first sale. If it’s awful – and it was awful, let me tell you – people won’t bother buying it again. And that’s what kills these kinds of things. In food as in so many other areas of life, the dollar is the ultimate vote. It doesn’t matter how many people vote for their favourite American/Canadian/Peruvian/Etc Idol star if they don’t go out and buy their album, go to a gig and show the kind of support that matters in business: financial support. What can we all learn from this? If you genuinely like something in the grocery store, buy it, then buy it again and again. There’s limited shelf space in a supermarket or corner store, and those shelves have to earn money. If your favourite product isn’t pulling its weight, it’ll get tossed in favour of something else more likely to shift more units in that spot. We regularly get comments on posts here about products we’ve reviewed that have since vanished from shelves. People are heartbroken that their favourite product has been consigned to the dustbin of food history, but instead of blaming the companies for killing off their beloved product, they should ask themselves a few blunt questions: how many tins/jars/boxes/bags of this beloved product did they buy in a year? Did they introduce their friends to it? Did they ask for it at a grocery store that didn’t carry it? Companies don’t typically discontinue highly profitable products with a loyal audience of repeat buyers. And for all you subversive types, an associated lesson: If you want to mess with a giant food company, go right ahead and break their contest by voting for the worst possible outcome. I heard the small town that the winner was from had computers set up for the townspeople to vote. It was a landslide. Wrecked a lot of salesman’s Christmas. Interesting. I can’t understand how Lay’s couldn’t just stack the deck in their favour by picking four flavours that were all reasonably good. Maple Moose wasn’t just so-so; it was vile. Since Lay’s gets to pick the final four and their flavour scientists are the ones making the seasoning, why even put something this bad in a position where it could actually win? I would still love to buy a bag or 2 when I’m in Newfoundland this summer in August. I asked a friend of mine who lives there to buy me some, but she forgot, and now they’re off the shelves. Is there any way to get a couple of bags or have they all been destroyed?